Kassanga, or Guhaja, as its speakers call this language, has been declared almost extinct in surveys finding their reflections in language catalogues such as the Ethnologue. But apparently, nobody bothered to check in the last thirty years whether the low speaker numbers reported in the most recent studies based on actual fieldwork on this language (Bühnen 1988 and Wilson 2007, based on data collected in the 1950s) really indicate a downwards spiral towards decline and extinction befor e casting their verdict. To be fair, it is true that it is very easy to miss this tiny among the small languages, since speakers, as with many small languages on the Upper Guinea Coast, don’t flaunt their linguistic repertoires. Speakers of Kassanga, who call themselves Ihajer have been at least bilingual for centuries. Like their close allies, with whom they identify ethnically, the (Baïnounk) Ijaher, it is part of their language ideology to be proudly multilingual and claim to speak the language of everybody who settles with them – this polyglossic attitude is part and parcel of their role as landlords who receive strangers on their territory. Already the first Portuguese sources from the 16th century mentions that there are strong ties between the Ihaja and the Baïnounk Ijaher (or Ñanjaher, who call their language Gujaher), and that they can easily communicate with each other. The Portuguese attribute this to the proximity of the languages, but it is far more likely that then, as today, the much less numerous Ihaja were already bilingual in Gujaher. Ijaher and Ihaja have strong bonds reported throughout the written history of the region and in their oral histories. Despite this longstanding relationship and partial bilingualism, the two languages have remained very distinct – Wilson (2007) reports 32% of related lexical items in a Swadesh 100 word list, and my preliminary data confirm this considerable distance. Unity in difference is a widespread societal pattern throughout the Upper Guinea Coast, and this alliance is no exception. 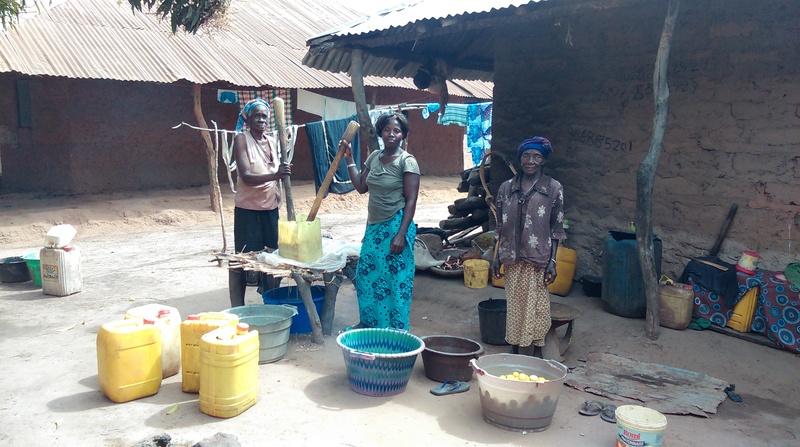 Both groups continue to cultivate family relationships across the border between Senegal and Guinea Bissau that separates many Ijaher from the Ihaja today, since Ihaja villages are all located in the former Portuguese colony of Guinea Bissau. Today, all of the Ihaja also speak Kriolou (which they call Gubaabo, ‘the language of the Toubabs’, the most widely spoken language of Guinea Bissau), and Mandinka, the language of the regional kingdom of Gaabu and an important lingua franca across the area. These two languages are also widely spoken on the Senegalese side of the border. Wilson (2007), based on visits in the area in the 1950s, reports seven villages speaking Guhaja, but claims a shift to Mandinka in most of them. Unfortunately, he does not give the names of these villages. Bühnen offers lexical data collected in 1987 and 1988 in Ganjand (Canjandé) and Sidengal (Bühnen 1988) as part of his historical research. A speaker of Guhaja to whom I talked in Agnack mentions seven now abandoned Kassanga villages and states that rather than shifting to another languages, speakers left them to migrate to cities. This is confirmed by Ihaja speakers in Ganjand visited in January 2016. They say that the abandoned villages were later taken over by Balanta and Pepel. When exploring the area on the other side of the border, we set off on the barely known dirt road that links Agnack with Campara, a village in Guinea Bissau at the crossroads with the main national road on which the Guinean Ihaja and Ijaher villages are lined up like beads on a necklace. 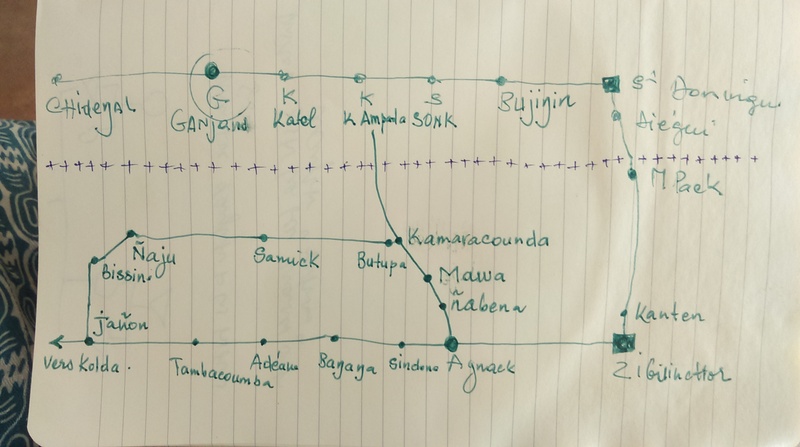 Rather than approaching the area on the N6 to Ziguinchor and then on the road 54 to San Domingo, I the idea was to retrace the route that people from Agnack take when visiting relatives on the other side of the border. Between Camarakunda, the last big village on the Senegalese side, and Campara, the dirt road trickles out and becomes a very bumpy and very sandy path, crisscrossing through palm and cajou groves and rice fields. The first village we visit is Sidengal. Facilitated by our companion, a Uhaja woman from Katel (Catel), we meet the village chief, himself a Uhaja, and a Guhaja-speaking family. That I speak Gujaher facilitates the establishment of contacts considerably, and that I already know some people in Ganjand from visits to Agnack makes it even easier to feel at ease with each other. Sidengal and Ganjand are Ihajer villages; Katel is a Ijaher village, and the closest to the three Guinean Ijaher villages (Sonk, Bijingen and Jegui). The patterns of observed and reported language use that we encounter in Sidengal is repeated in the two other villages, Ganjand (Canjandé) and Katel (Catel), that we will visit today: The vast majority of adults identifying themselves as Ihajer are fully bilingual in Gujaher, only some have only rudimentary knowledge of the language of their main allies. Children grow up in Sidengal and Ganjand learning Guhaja, but not so much Gujaher anymore, I’m told, and the explanation for this are changing marriage patterns. In Katel, nominally a Ijaher village, the inverse holds: adults are bilingual in Gujaher and Guhaja, plus a number of larger languages, but children learn only Gujaher, not Guhaja anymore. In the past, men would give their daughters to their sisters’ sons to marry. Since Ihaja women were married out to Gujaher-speaking men, their daughters would thus return to their mothers’s villages of origin in Ihaja area, and their grand-daughters to their mothers Ijaher villages. No wonder that Ihaja and Ijaher consider themselves the same! With more individual freedom for both women and men to marry according to personal affinity rather than to their fathers’ wish, cohabitation patterns are reported to become less predictable, and the social motivations for being bilingual in two tiny languages are said to become eroded. Still, in Agnack, the village where I mainly conduct my fieldwork on Gujaher, there are three Ihajer women who have been married to Ijaher men in the six households of this tiny hamlet, and one who returned to Ganjand, so the bond is very much alive for now. And in Ganjand, everybody is firm in stressing that the marriage relationships are very much alive and children continue to be bilingual. As if to confirm this impression, on my second visit in Ganjand, I find its village chief returning from paying condolences to a family in Agnack – he learned of a death earlier than I, who lives there and left that very morning! After returning to Agnack I visit the family of the deceased and learn that they are preparing for a wedding in Ganjand. A woman from Senker will be married there. At the end of this very instructive firt visit, we pass several villages inhabitated by speakers of Kobiana or Guboy on the way back. Kobiana is another language with a negative forecast in mainstream catalogues. The Kobiana maintain close links with the Ihaja, and their languages are lexically very close. It strikes me one more time how different the dynamics of language maintenance and language change are in the entire region. Though often invoked as “killer lang uages”, people don’t give up smaller languages because of large scale shift to these languages – Mandinka, Wolof, or Krioulou. In fact, speakers in Katel, when asked about the presence and importance of Mandinka volunteer that while most of them speak Mandinka, nobody would shift, and that some people ‘become’ Mandinka at surface level only, because they convert to Islam, homonymous throughout the area with being Mandinka, but that this apparent change has no consequences for their language use. Languages are added to repertoires depending on their utility and on personal trajectories, but these languages do not necessary supplant smaller languages. 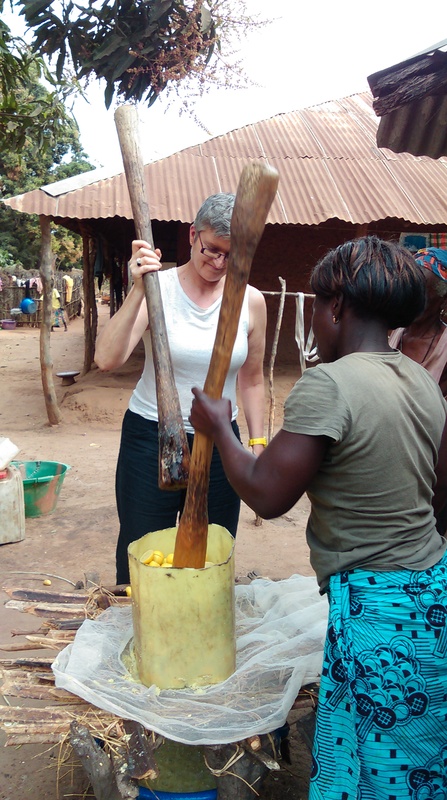 One more time, it seems that the take-home message from Casamance is this: what keeps small language alive is societal multilingualism, and specific languages are used for as long as they serve a social purpose. Their role as markers of a conjoined, but partly distinct identity must also contribute to keeping them distinct – it is quite astonishing for two genetically closely related languages to be spoken by a population bilingual in both of them to remain so different over at least six centuries. A contact linguist’s dream – and like other small-scale multilingual situations, a setting that calls for being documented, since the present-day configurations and their impact on structure and lexica of languages can provide us with likely historical scenarios to help understand how languages in this area were and continue to be shaped.